| desc = Mika punches three times, then finishes with a dropkick that distances herself from the opponent. | desc = Mika microdashes forward for a straight punch, following with a burst of energy if it hits and finally a forward leap for a hip strike. | desc = Mika performs two quick punches. | desc = The A version sends Mika across the screen on the ground, while the B version sends her upwards at a 60-degree angle. | desc = A command grab.<Br/><br/>Mika-chan Cannon can throw a grounded opponent. She can also throw a knocked stunned opponent, including airborne ones.<ref name="BBTAG-Mika-Character-Explanation"/><Br/><Br/>Mika jumps forward a short distance and attempts to grab the opponent. Failing to will lead to a period of flailing around. | desc = Mika charges just short of fullscreen (she *will* hit a fullscreen opponent, however). | desc = A command grab.<br/><br/>Mika jumps forward almost fullscreen to grab her opponent. Failing to will lead to a moment of flailing around. | desc = You become invulnerable at the start of the action.<br/><br/>Mika punches into the sky at a 45-degree angle, then makes a sharp turn to dive into the ground, also at a 45-degree angle. If the first of the two strikes hits, then when Mika lands, her head will be stuck in the ground for a moment. | desc = A command grab. You become invulnerable at the start of the action.<br/><br/>Mika-chan Hip Strike can throw a grounded opponent. Upon successful throw, you can increase the damage dealt by pressing a button at a certain timing.<ref name="BBTAG-Mika-Character-Explanation"/><Br/><br/>Mika grabs the opponent, slams into them with her hip, and follows up with two more punches. | input = P during the main character's Distortion Skill. | desc = You become invulnerable at the start of the action. | desc = You become invulnerable at the start of the action.<Br/>[Requirements]In order to activate, you must have Resonance Blaze active (Lv 4), have 9 Skill Gauges at time of activation, and the opponent must be down to one character. Although small in stature, she's a power fighter specializing in close range fights. With the hit-and-run Mika-chan Missile and the command grab Mika-chan Cannon, shake the opponent's guard! Mika punches three times, then finishes with a dropkick that distances herself from the opponent. Mika microdashes forward for a straight punch, following with a burst of energy if it hits and finally a forward leap for a hip strike. Mika performs two quick punches. The A version sends Mika across the screen on the ground, while the B version sends her upwards at a 60-degree angle. Mika-chan Additional Missile is a lunge attack that travels in the desired direction. You can follow up once from the A and B versions of Mika-chan Missile, and up to three times from EX Mika-chan Missile. 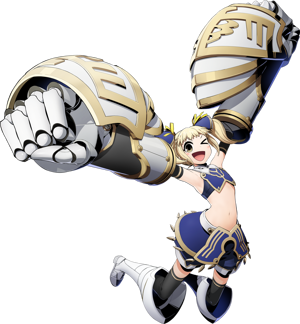 Mika-chan Cannon can throw a grounded opponent. She can also throw a knocked stunned opponent, including airborne ones. Mika jumps forward a short distance and attempts to grab the opponent. Failing to will lead to a period of flailing around. Mika charges just short of fullscreen (she *will* hit a fullscreen opponent, however). Mika jumps forward almost fullscreen to grab her opponent. Failing to will lead to a moment of flailing around. Mika punches into the sky at a 45-degree angle, then makes a sharp turn to dive into the ground, also at a 45-degree angle. If the first of the two strikes hits, then when Mika lands, her head will be stuck in the ground for a moment. A command grab. You become invulnerable at the start of the action. Mika-chan Hip Strike can throw a grounded opponent. Upon successful throw, you can increase the damage dealt by pressing a button at a certain timing. Mika grabs the opponent, slams into them with her hip, and follows up with two more punches. P during the main character's Distortion Skill. Crouching B is invulnerable against head attribute attacks, so it is effective against jump-in attacks. Upon hit, jump cancel into an air combo to deal additional damage.